Need a New Pair of Boots? Are you looking for a new outfit? Stop horsing around at ho-hum clothing stores and visit Blair’s Western Wear today. You can find a wide variety of western boots, apparel and accessories at our shop. You’ll always find comfortable and stylish clothing and accessories at Blair’s Western Wear. We feature unique items that you won’t find at any other department store in town. 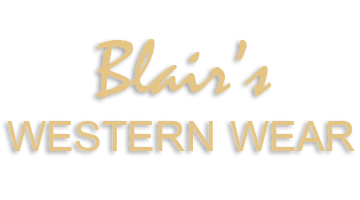 For over 32 years, we’ve remained focused on the latest trends in western clothes, footwear and accessories at Blair’s Western Wear, including jewelry from West and Co. Come by today to find out about the other brands we carry. That’s right – you’re Wanted! Our clothing store is designed for the roughest, toughest cowboys and cowgirls around. Okay…we welcome urban western enthusiasts, too. With new clothing, footwear and accessories arriving daily, you’re sure to find a getup that suits your style. Stop by Blair’s Western Wear today to browse our wide selection of western apparel. We look forward to seeing you soon! Copyright © 2019 Blair's Western Wear, all rights reserved.